The CBA3G-100 amplifier from Teseq covers frequency range from 800 MHz to 3.1 GHz with rated power of 100 watts. 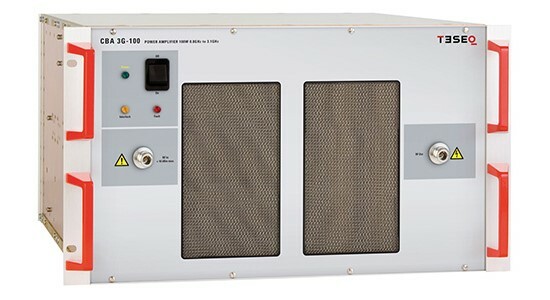 These amplifiers are specially designed for radiated EMC testing. Mostly antennas are usually well matched at higher frequencies but the EUT in the path causes enough reflection to disturb the amplifier. However Teseq’s antennas are Class A and designed to tolerate these reflections. The antenna gain is mostly constant at higher frequencies but the cable losses increases with frequency. So fulfill the requirement of testing power, amplifier needs to produce more power. The teseq’s amplifiers are therefore designed to produce the linear power up to and beyond the frequency range specified. The GaAs Class A design of Teseq’s amplifiers ensures a high reliability, low distortion linear performance across the frequency range. All amplifiers are power thru switch mode power supplies to provide high efficiency and high power factor. The units are cooled by internal fan also the temperature sensing is provided to measure the malfunction of the fans. For amplifier to put in the stand by mode, there is a provision of safety interlock connector. There are front panel indicators to show the over temperature.